I just got some new pictures I wanted to share. Last June I sent a trio to Benton Chapel for the wedding of Lindsay and Dustin. The photographer was Lisa Shelby of Lisa Shelby Photography. I thought she did a wonderful job and just wanted to pass that along. I love pictures of weddings taken from the back when the bride has a long train. So dramatic. I mentioned earlier about September being the new June. 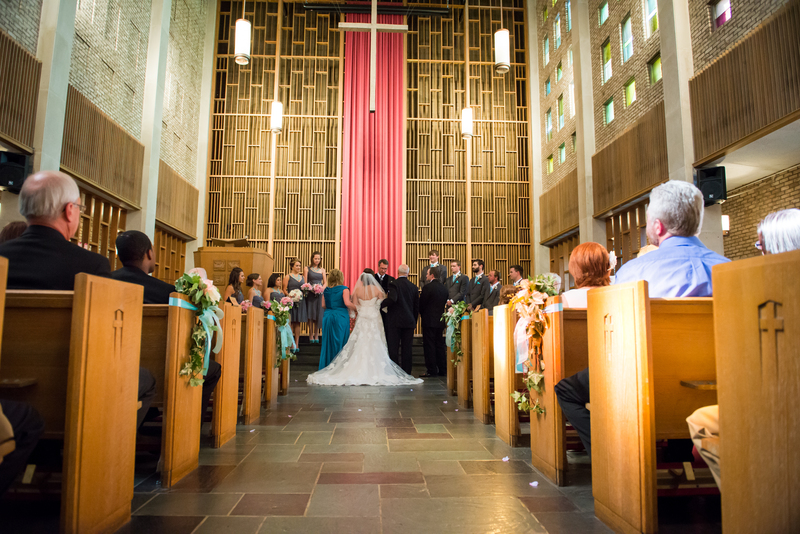 Susan Mullen took care of the wedding of Jessica and Chase at Vine Street Christian. I tried to play helicopter contractor stopping by before the prelude was to start to make sure all my instructions were received. Susan nipped that in the bud by kicking me out so she could take care of business. Jessica and Chase were delightful to work with and I was sorry I couldn’t be there. I did get a glimpse of her as I dashed into the sanctuary. I almost didn’t recognize her with her makeup and hair all done up and dressed in a lovely gown. For this wedding Jessica chose “Canon in D” for the bridesmaids and “A Thousand Years” for her entrance. With the able coordination of Julie Fletcher the musicians were able to create a dramatic entrance for Jessica with the beautiful introduction and melodies of “A Thousand Years”. At the end of the ceremony the trio sent them off to the delightful song “That’s Amore”, a song we’d never used for this purpose before but it was so appropriate. Congratulations to Jessica and Chase and I truly wish for them a long and happy marriage. Saturday, September 20, was indeed a popular and a most beautiful day for a wedding. I took a quartet to Woodmont Christian Church for the nuptials of Katie and Aaron. 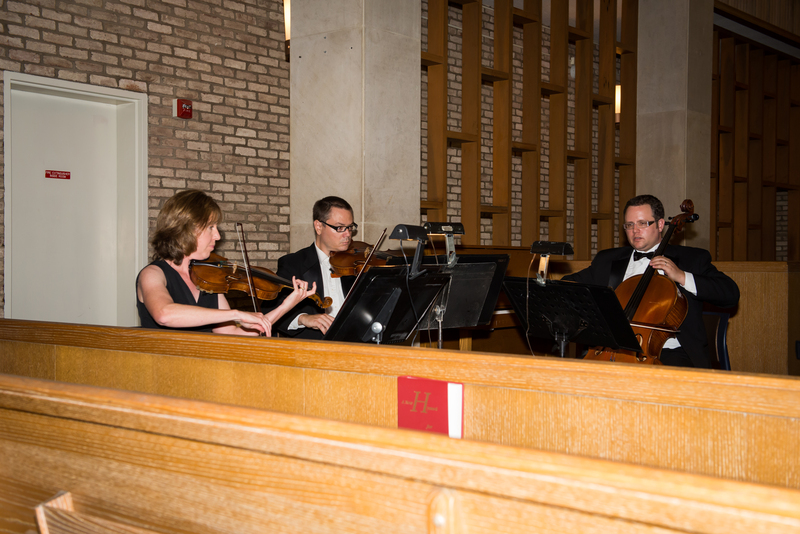 We warmed up the sanctuary with an eclectic mix of soft rock, movie themes and classical music. Katie’s special request was a song called “Secrets” (One Republic) that I patterned after The Piano Guys version of the tune that features the cello. This year we’ve had quite a number of requests for tunes that have translated wonderfully to string quartet. John Legend’s “All of Me” is another tune we played during prelude that sounds great with string quartet. Aaron’s father had the honor of officiating the ceremony. How sweet is that? Katie chose “Canon in D” for her trip down the aisle to join Aaron. With the long train I’m sure pictures from the balcony of her entrance will be stunning. But I’m ahead of myself…her bridesmaids preceded her to “A Thousand Years”, a song that we’re playing more and more often. Before that we accompanied the mothers’ entrance with “Can’t Help Falling In Love”. Vows said, rings exchanged, Unity Candle lit, it was time to send them off as Mr. and Mrs. to the strains of “All You Need Is Love”. Congratulations to Katie, Aaron and their families and many wishes for a long and happy life together. As I was saying about September being the new June…. Last weekend we were a trio at the tiny chapel that is part of King’s Chapel on Hwy 96 between Franklin and Murfreesboro where Margaret married her sweetheart, Dave. Instead of bridesmaids and groomsmen, Margaret and Dave had 6 flowergirls and two ringbearers. We brought them in to the Feather Theme from Forrest Gump, a perfect tune for the girls. Margaret chose the traditional “Trumpet Voluntary” for her entrance. After the deed was done we sent them off to the reception to Handel’s “Hornpipe”, another joyful, traditional selection. The trio reconvened at the reception which was held in a clubhouse of sorts a few steps away from the chapel. This is a beautiful place to hold a reception with a pool in front and a veranda in the back overlooking a rustic, wooded area. Margaret had requested the Nocturne from The Secret Garden to which she and Dave had an unofficial first dance. The announcement of this tune brought audible “awwws” from the female contingent. We had rehearsed it in the chapel where the acoustics are so live and hoped Margaret would be able to hear it at the reception, it’s so beautiful. Fortunately she was able to hear some of it in front of the chapel as they were taking pictures. Congratulations to Margaret and Dave and their families! Best wishes for a long and happy union. Have I ever said that September is the new June? The first weekend of June found us at the Loveless Barn out Hwy 100 where Laura and Adam were wed in the presence of friends and family. The trio started off with a mix of contemporary tunes to set the mood including “Can’t Help Falling in Love” and “Dream a Little Dream of Me”. After mothers and bridesmaids were in place Laura arrived at the altar on her dad’s arm to the strains of my now favorite bridal processional – “A Thousand Years”. After the pronouncement of husband and wife we sent them on their way as Mr. and Mrs. to “Signed, Sealed, Delivered”. Congratulations and wishes for a long and happy marriage to Laura and Adam! I’ve been remiss….again….in reporting on music events. My brain is apparently still on holiday. I spent most of the month of August in Lakeside, OH, a Chautauqua on Lake Erie. In the early part of the 20th Century there were traveling shows featuring music, lectures, family entertainment and many other types of cultural offerings. Several of these “Chautauquas” became permanent, Lakeside being one of them. I go every August to participate in the Lakeside Symphony Orchestra, a symphony in residence at Lakeside . Twice a week the symphony presents programs of pop and/or classical music or accompanies a ballet or an opera. Many of the members have been coming to Lakeside for more than 40 years, a testament to the commitment of the musicians to the symphony and the community to having an orchestra during the season the Chautauqua is operating. When they’re not rehearsing or presenting concerts, the orchestra members enjoy the lake, the quiet and safety of the little town and the many shows presented in the old Hoover Auditorium, the hub of activity at Lakeside. So if you ever find yourself in the neighborhood of Lakeside, OH in August, come in to enjoy this little Victorian town, play a little shuffleboard, loll on the dock in the sun and hear a concert in the big auditorium.